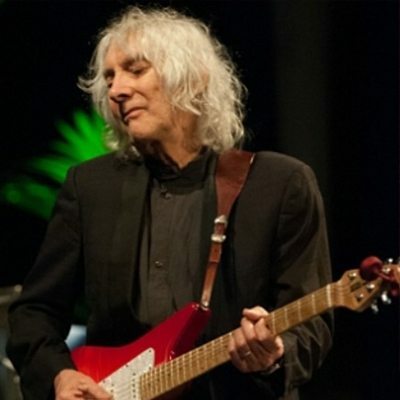 Albert Lee occupies an odd niche in music — British by birth and upbringing, he spent the mid-’60s as a top R&B guitarist, but in the 1970s became one of the top rockabilly guitarists in the world, and no slouch in country music either. In England he’s a been household name, and in Nashville and Los Angeles he’s been one of the most in-demand session guitarists there is; but outside of professional music circles in America, he’s one of those vaguely recognizable names, and occasionally misidentified with his similar-sounding contemporary, ex-Ten Years After guitarist Alvin Lee (with whom he did share a berth once, in Jerry Lee Lewis’s band on the latter’s London Sessions album) — but where Alvin was a hero of Woodstock and a flashy guitarist, in the manner of British blues extroverts Jimmy Page and Jeff Beck, Albert is much more likely to be found playing in the background, behind the Everly Brothers or alongside Eric Clapton. Lee was born in Leominster, England, in 1943. His introduction to music came from his father, who played piano and accordion. His first instrument was the piano, which he took up at age seven — he was lucky enough to be more than five years into his keyboard study when rock & roll came along, and his first idol was Jerry Lee Lewis, which also marked his introduction to rockabilly music. Within a couple of years, however, Lee had switched to guitar, and also discovered the music of Buddy Holly & the Crickets. He started learning the guitar in earnest and studying their records very closely, and not long after graduated from an acoustic to an electric instrument, and was learning the lead guitar parts on records by Holly, Gene Vincent, Ricky Nelson, the Louvin Brothers, and the Everly Brothers — except that to him they were just as much records by Tommy Alsup, Jimmy Bryant, Cliff Gallup, James Burton, Chet Atkins, and Hank “Sugarfoot” Garland, among other guitarists. At 16, he turned professional and joined the stable of musicians working for manager Larry Parnes, playing behind Dickie Pride, among other stars on Parnes’ roster. He later joined the backing band of R&B singer Bob Xavier, and later played behind Jackie Lynton, through whom he appeared on his first recording. Lee twice succeeded Jimmy Page as a lead guitarist, first in Mike Hurst’s band and then in Neil Christian’s backing group. And Lee, in turn, was succeeded in the latter band by Ritchie Blackmore when he jumped to Chris Farlowe’s backing group the Thunderbirds. He spent four years with the Thunderbirds, who became known in British musical circles as one of the best R&B bands in England, and all gained fame as Farlowe charted singles (including a number one hit) in 1966 and early 1967. He finally left Farlowe in 1968, feeling bored after four years, and over next two years passed through several bands playing behind various visiting American country stars, including George Hamilton IV, Skeeter Davis, and Bobby Bare. Lee passed through several groups, including Country Fever and Poet & the One Man Band, before finally reaching a semipermanent berth with Heads, Hands & Feet, a progressive country outfit who were sort of England’s answer to the Flying Burrito Brothers or the Nitty Gritty Dirt Band. He first achieved public notice as a member of this group, which achieved some positive critical notice — and allowed Lee to expand his playing beyond the guitar — but saw little commercial success. They split up after two years, and Lee made his living as a session guitarist for the next couple of years, and was also able to latch on to a piece of new recording action going on in England. In 1970, Chess Records had scored an unexpected chart success with The London Howlin’ Wolf Sessions, which had led to a spate of “London Sessions” albums by Muddy Waters and Chuck Berry, among others at Chess, and even a B.B. King album on ABC Records built along the same lines. He got in on Jerry Lee Lewis’ London Sessions album, and that seemed to reopen Lee’s relationship of the early ’60s with American acts — except that this time one circle of his life seemed to close when he was chosen to replace Glen D. Hardin in the Crickets. He toured with them and also cut sides with them in Nashville for a Mercury Records release, Long Way From Lubbock. When the smoke cleared from his two years with the band, Lee had moved to Los Angeles, where he made contact with Phil Everly and Don Everly, who were working separately at the time. Lee joined Don’s band and even got his Heads, Hands & Feet bandmates to work on his Sunset Towers LP. From there, Lee became a member of Joe Cocker’s band, which, in turn, led to the offer of a contract in 1975 to do a solo album with A&M Records, which was Cocker’s label at the time. A gig playing (and recording) with Emmylou Harris delayed the completion of his own record for a couple of years, until the end of 1978, though when Home, as it was titled, finally appeared, it was not only a guitar virtuoso showcase but included Harris on it as a guest performer. He was signed to Polydor as a solo artist, but by that time the session work and offers were coming in fast and furious, and Lee was seemingly everywhere, playing with everyone from Jackson Browne to Bo Diddley to Herbie Mann. His most visible gig, however, was playing with Eric Clapton, first on Just One Night and then on the tour that followed. And when the Everly Brothers reunited for a concert, a live album, and a concert video, Lee was there in the band. Lee’s own solo career continued into the late ’80s with Speechless (1987) and Gagged but Not Bound (1988), both issued by MCA and both critical successes. He was also later a member of Gerry Hogan’s bluegrass group Hogan’s Heroes, and toured and recorded with Bill Wyman’s band, the Rhythm Kings. He has also played with Eddie Van Halen and Steve Morse in a supergroup called the Biff Baby All-Stars. In his fifth decade as a professional musician, Lee was part of a rarefied fraternity as a virtuoso’s virtuoso, respected on three continents and pretty much living out a professional life that most of his colleagues, when he started out, could only dream of. He continued to record in the 21st century, cutting the country/rockabilly album Heartbreak Hotel for Sugar Hill in 2003. That same year, Castle Records issued a Lee retrospective compilation, That’s All Right, Mama. A second Sugar Hill release, Road Runner, appeared in 2006.